So I've had these markers sitting around and thought I would try them over the spray paint. If you've been spraying you know it can be hard to write over. Sharpies and grease pens are fine....but THESE! Go run and get some while they are still on the rack. Elmers website say "no longer available". What are they thinking? The metallics are a yawn, they clog up like most other metallics. This WHITE is smooth and dreamy and write over spray. It's called ELMERS PAINTERS, Opaque Paint Marker. You can thank me later :) Oh, and I prefer the medium tip, but we can't be getting picky during this tragedy. EDIT: here's what they look like and I just found some online HERE. Art in Action. Performance Art. 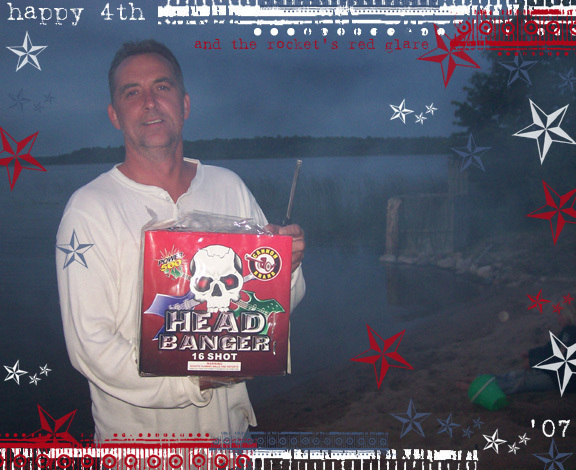 It began with Denny Dent, then followed Brian Olsen and Dan Dunn (freebird on a spinning canvas! 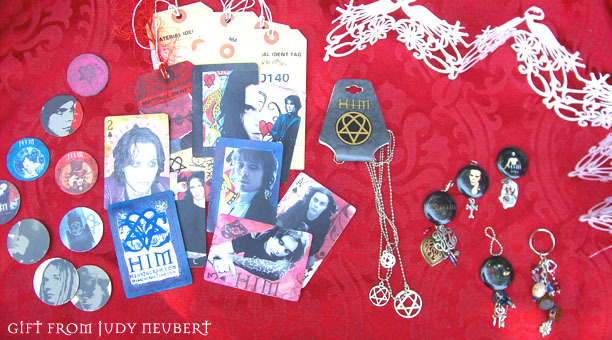 and his site here). Painting to music, with BOTH hands. Lovin' it. I get asked alot about my concern for the environment with spray painting. I do protect myself by wearing a mask (especially indoors). 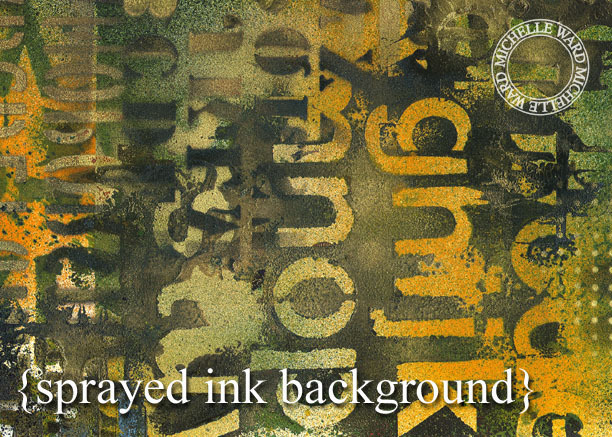 An alternative to paint is ink. 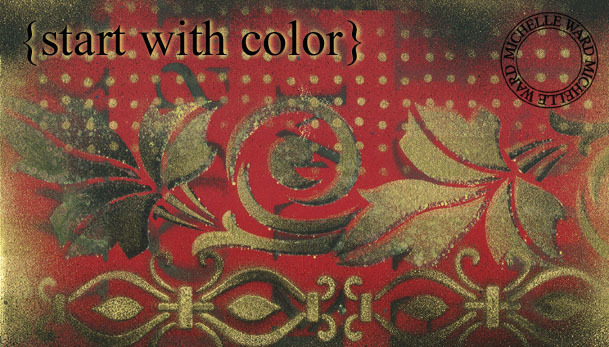 There are several colors available through Ranger. 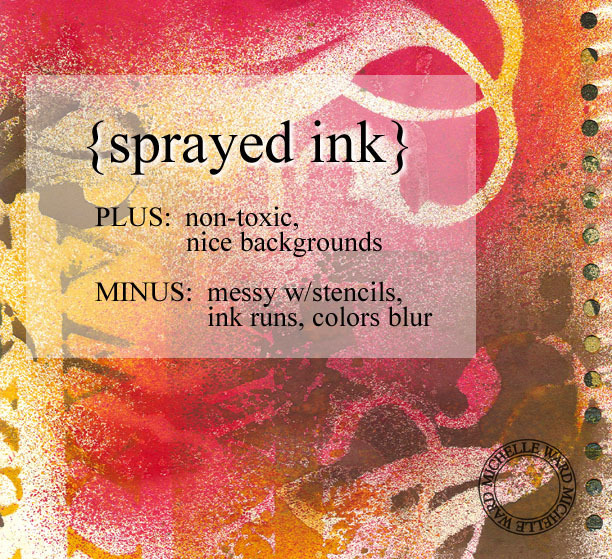 I call them spray ink but it's really named Color Wash, and is a water based dye in a spritz bottle. They can give you some cool effects, but don't work in the same way as paint. After alot of experimenting I choose to mostly use them for backgrounds. Above is an example of a full sheet that I enjoy making and will cut down for various end uses. Notice the alphabet (on the right), monoprinted like we talked about earlier this month. 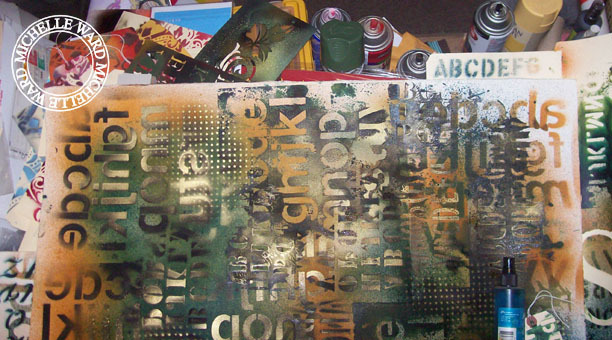 If you use stencils the way I do with paint, then you know you can work fast because of the way the paint dries on the surface and the stencil. 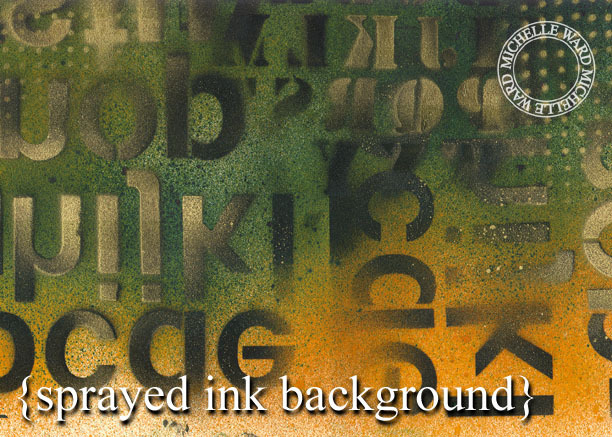 If you try to work the same way with ink you will bum out because the ink puddles on the plastic stencils and will drip off as you try to move it. Bleh! 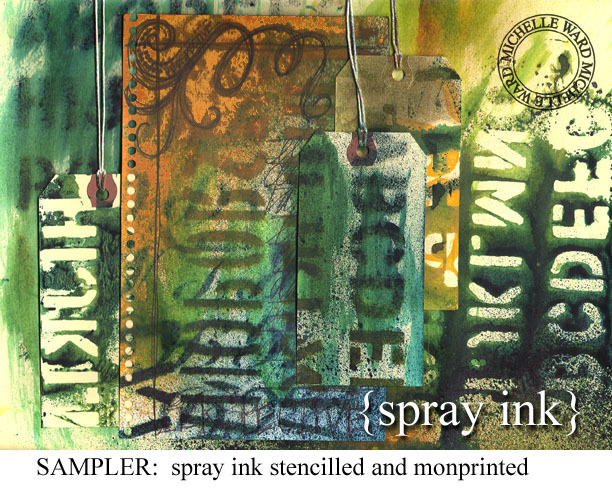 You could be prepared for a quick monoprint with another sheet of paper....that would sop up alot of the ink from the stencl before you move it. It helps to know that sprayed ink will smear as it's water based. Use that information wisely. Be careful when using a glue to attach something over it...the gooby edges could get all weird and if your layered image is too thin the color might bleed through. Might be cool, but might be heartbreaking. The smear factor is cool if you want another look, spritz with water and pull a paper towel across it. Or be lazy like me and try spitting and smearing with your hand. Some smears below. 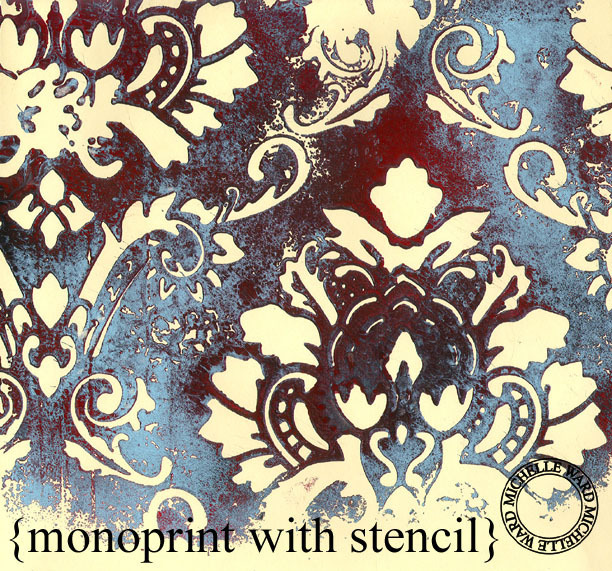 Stencilled or stenciled? Had to look it up. Now we know. Lots of love being spread over on the Street Team. I'll post some of the cool arrivals to my own mailbox and front step in the next few days. 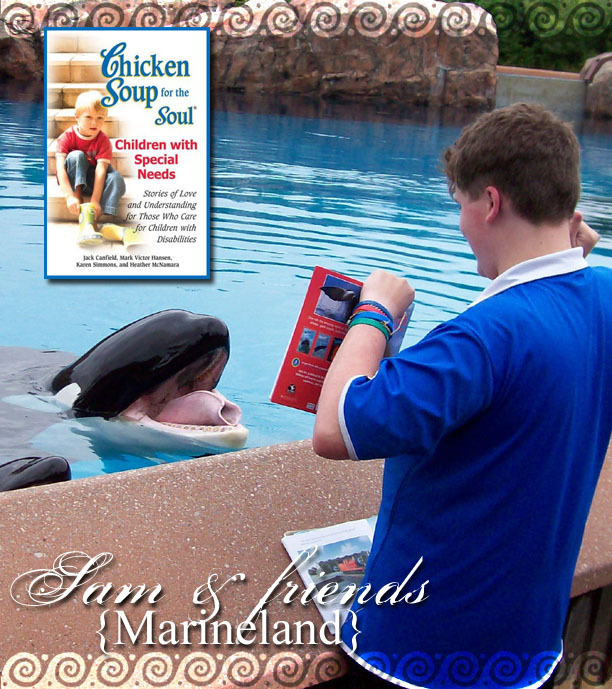 An exciting announcement: Just confirmed, the story I wrote here (and follow-up here) last fall about our visit to Marineland, is going to be published in the new Chicken Soup for the Soul: Celebrates Children with Special Needs. And in case you missed the tiny clip I caught on my digital camera, look here. 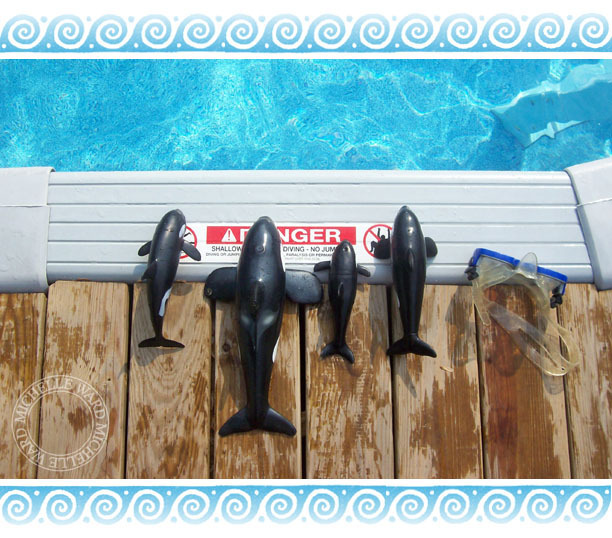 We are heading back to Marineland in one month, can't wait to see our friends again! Being a blogger has been a rewarding experience particularly because of the connections made with new and interesting people. In addition, I get to see into the worlds of those close to me and total stangers too. This morning presented an added bonus! I met in real life with a new friend, and fellow blogger, Susanna Gordon. The hours flew by as we discovered we had much in common. She has amazing talent and had brought show and tell of some stunning encaustic work. She is also a gifted photographer which you'll see when you hop over to her blog, or crack open Artful Blogging to page 100. STUNNING. 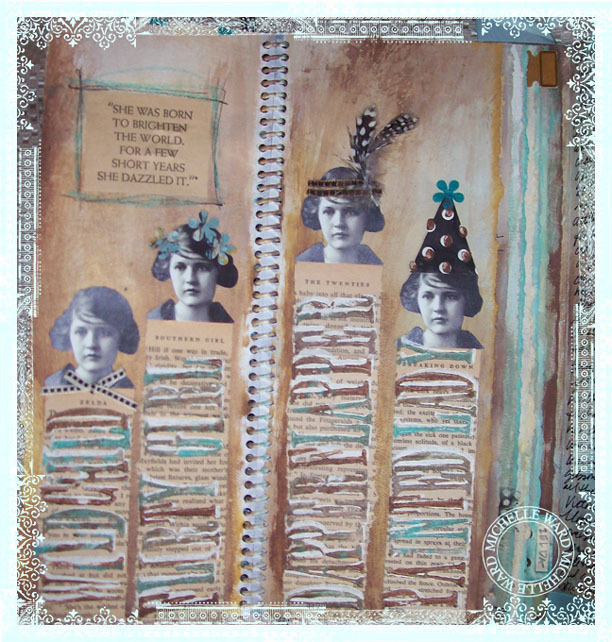 Next time I hope I get to see her sketchbooks! Bookmark her blog...she's always sharing something interesting. 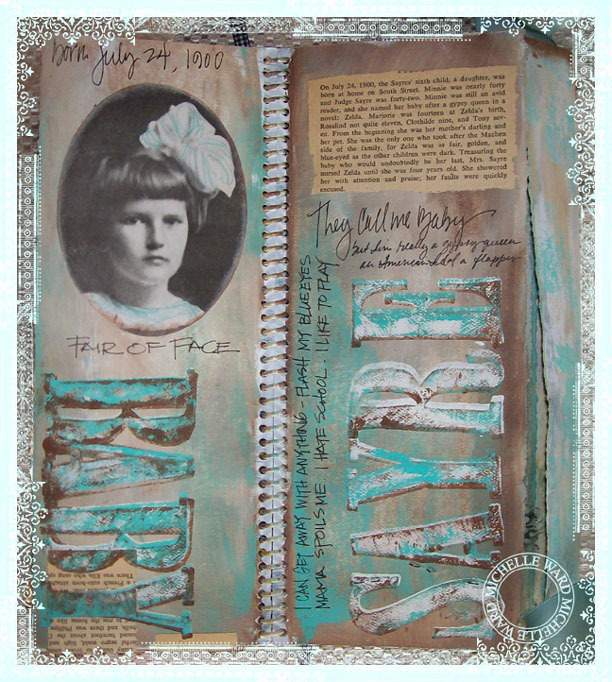 Artful Blogging, a new publication by Stampington & Co. arrives. 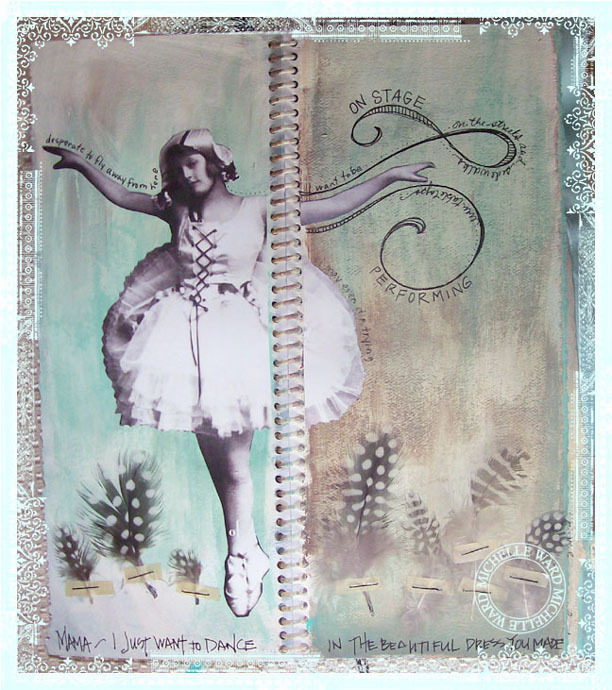 I am flipping through the attractive pages and I discover the article of Susanna's Sketchbook, a blog I had never visited. Love what I see....hop over to the site....say to myself, "she's in NJ, must say hello"....jot a note....Susanna writes back....we discover we live IN THE VERY SAME TOWN....as the crow flies it's barely a mile....so here we are....at Starbucks TODAY. It was a gas to meet ANOTHER ARTIST who gets how cool it is to blog and knows the rewards to be had by putting yourself out there. 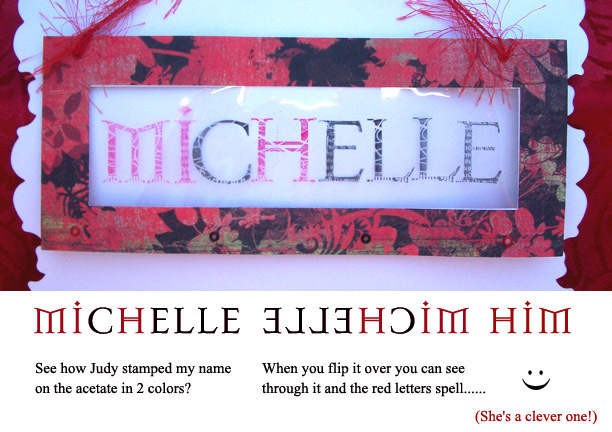 She is exactly the kind of person you would want to meet - very interested in seeing all there is in our neck of the woods, plus she makes cool stuff. A connection and opportunity we might have missed. 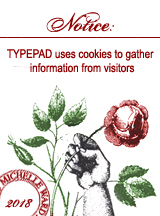 You're here, therefore you're a blog reader. You'll love this magazine. Thinking about starting your own? Get it. Already have your own? Get it. 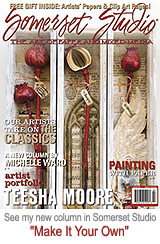 It is a very juicy publication - filled with terrific visuals and stories about the blogging experience (including my darling friend Lisa Hoffman and my Street Team!). Do you have a blog but you get that blank face when you talk to someone who doesn't get it? This is perfect evidence to prove you're not alone. Hits newstands August 1st but I've heard it's already showing up in stores. You can also order direct from Stampington. I can't be out spraying or swimming, so I'm getting caught up here. I've started a new album on the sidebar (left) for my spray infatuation. If you're like me, your stencils are getting really built up with paint. 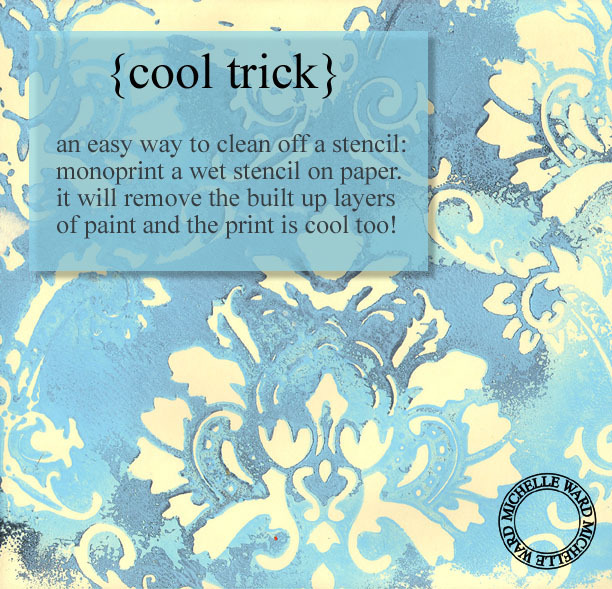 Keep some scrap paper (or my favorite: file folders) on hand to lift off the excess when it's wet.....it will not only give you a cool print, it will also remove layers of paint. The RANDOMness of it delights me. 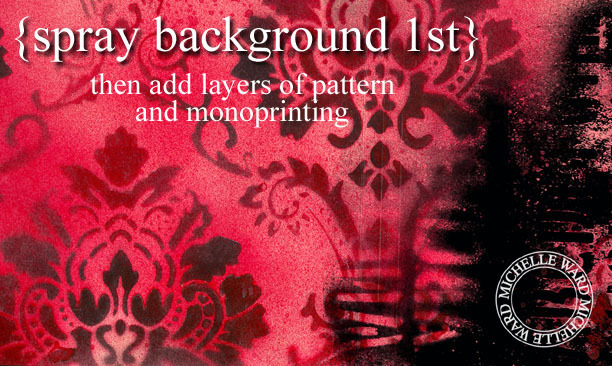 And when you are spray painting don't forget you can begin by covering your surface with paint first, THEN add the patterns. 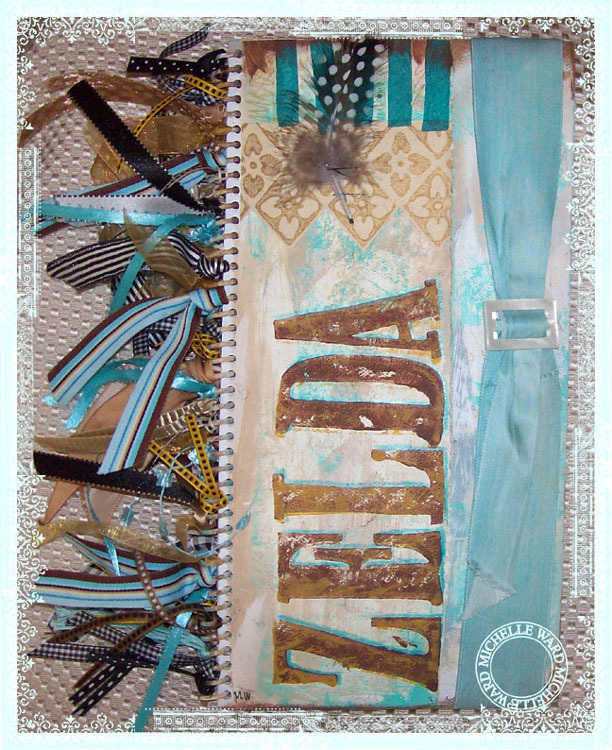 Or start with colored paper as your background......metallics always look better over a dark ground. And if you're busy preparing cool sprayed envelopes for Crusade No. 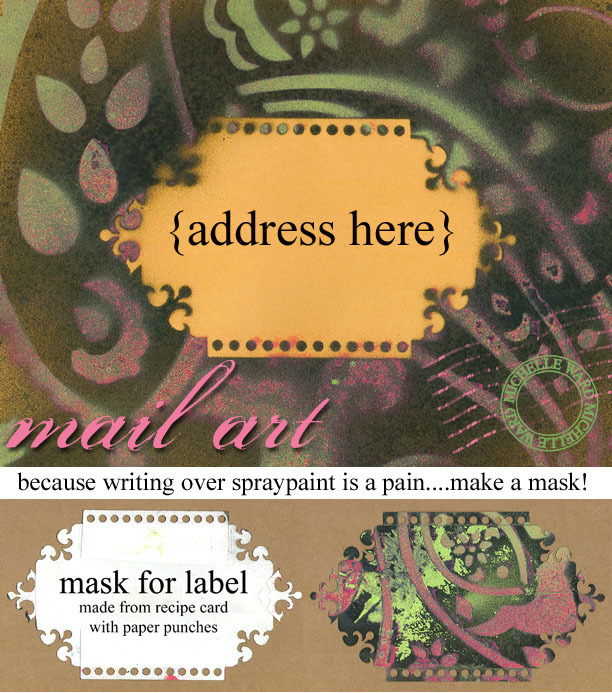 10, you'll love this trick....It's really a pain to write over a sprayed surface, and address labels don't always stick. Try making a cool mask to lay down before you spray, then left off for a perfect place to write the lucky name. 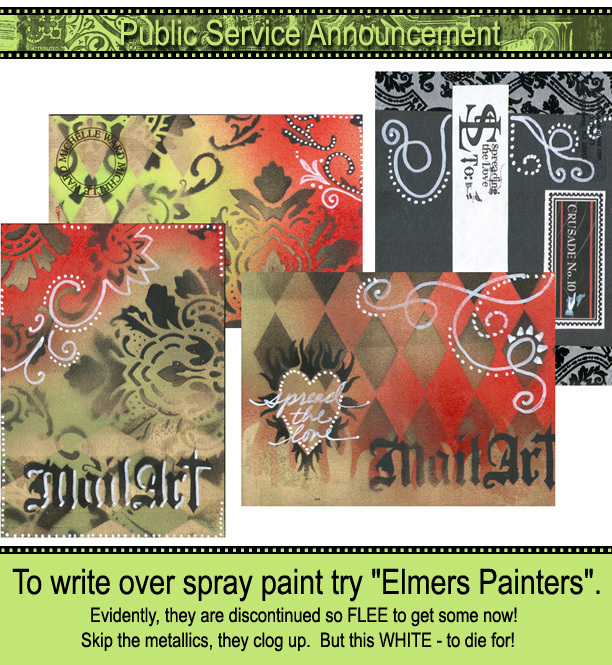 I mentioned this on the ST blog....you can spray on clear envelopes (and even acetate! 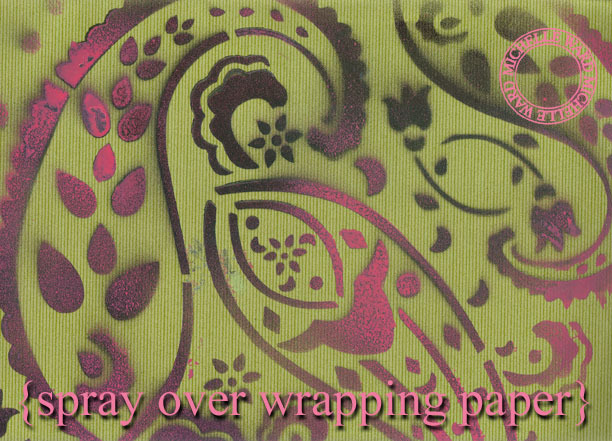 )....it doesn't come off, but you do need to let it dry longer than you would for paper or it will smear. And don't forget to save all your paper used to protect your table....this stuff is priceless! Get the Sunday paper and lay in your spray station (you are using a spray station right? a box to keep the spray paint from infiltrating your entire studio or yard?) 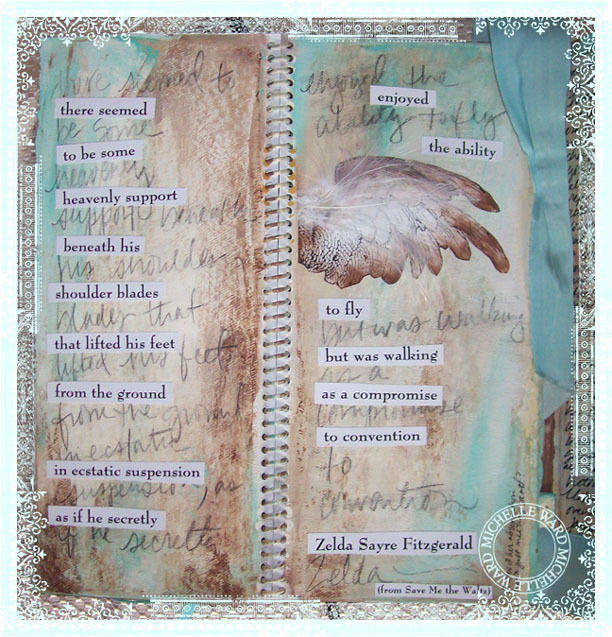 then as each page gets soaked, peel away to the next page but keep for collage material. We met July 26, 1984....just ten days AFTER he turned 19. I was 20. I wonder ~ if he had still been 18 if I would have let him drive me home from Maximillian's Night Club that night. Probably, couldn't resist his charm. Still irresistible @ 42. 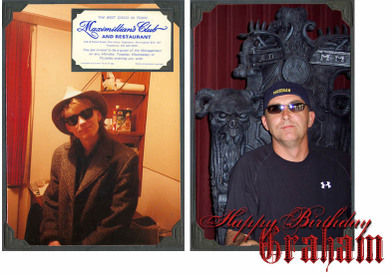 Happy Birthday Graham! 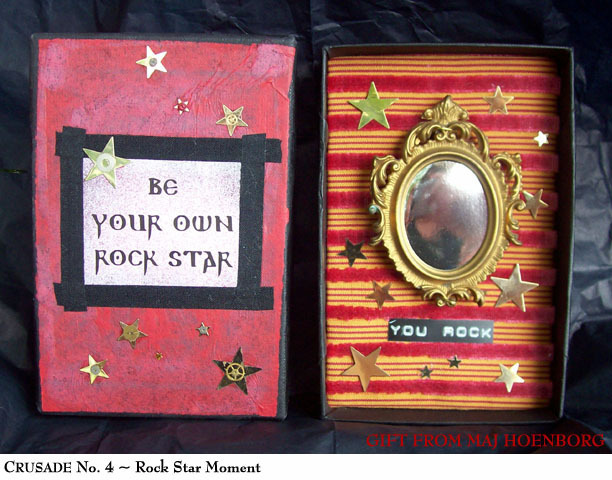 You still rock! 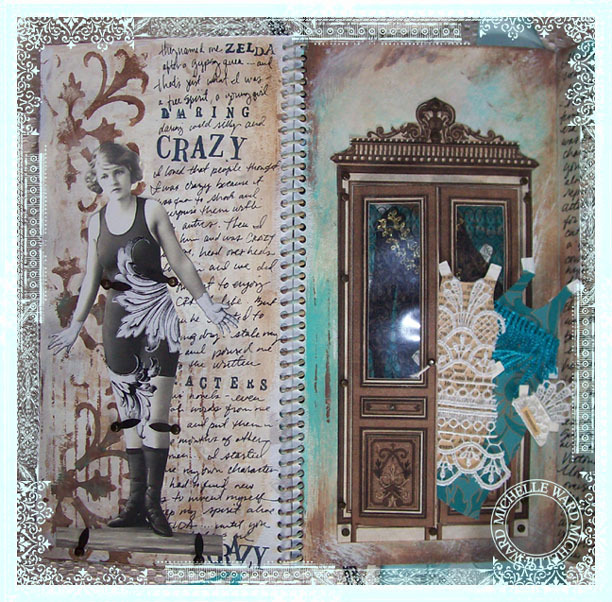 ARTFUL BLOGGING ARRIVED!! Will write more later.....but I did post on the Street Team page about it. One hundred and seven. No, it's not the temperature here. It's how old Zelda Fitzgerald would be on July 24th if she were still alive. I made a book and paper doll of her for Lynne Perrella's book Beyond Paper Dolls (2006), then followed it up with an article "An Ode to Zelda" in the March/April 2007 issue of Somerset Studio magazine. Love that brilliant soul. 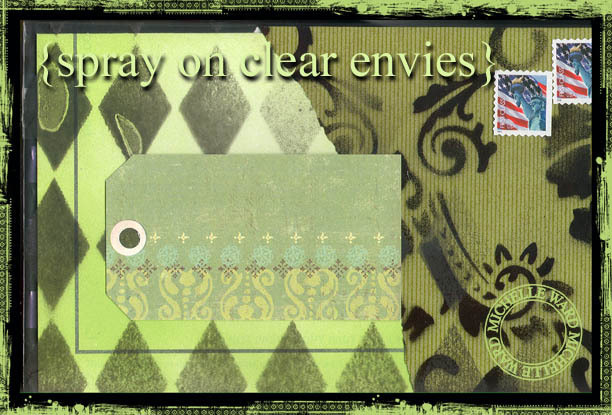 It's about sending Mail Art - you can read about it over HERE. So like not even 24 hours pass and this box lands on my doorstep. 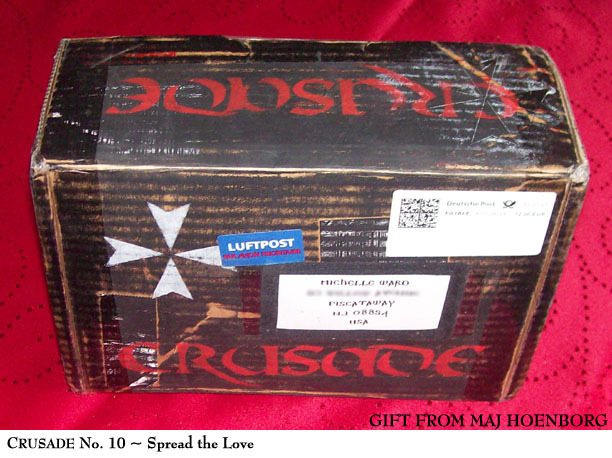 She had no idea.....but in sending me her Crusade entries 1 through 9, she also entered No. 10. Say it with me: How Cool Is That? SHE is Maj Hoenborg, currently living in Germany, native of Denmark. Maj is pronounced "My", (not Madge) the word for May, (the month we were both born in) as I learned when I called her the other night.....very late in her time zone but I wanted her to hear my enthusiasm. More about Maj further down. You KNOW my heart skipped a beat when I saw this package. I didn't even have the brains to stop and photograph her thoughtfully wrapped contents....I just attacked. Wouldn't you? If you don't know the details behind each crusade you will have to look it up..... Not only is this a stunning pen, and just my thing.....but it writes with ROSE SCENTED INK! AND.....drum roll......she sent a package of refills too! You KNOW I screeched over that cleverness. 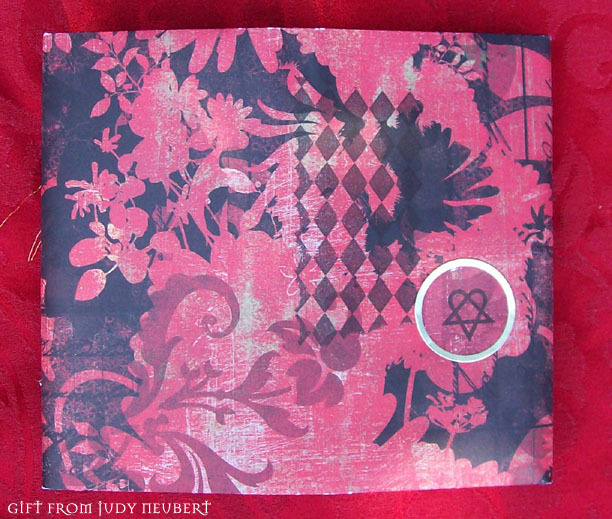 The embossed paper was wrapped around one of the packages - I included it so you could see the pattern. Maj's Cheap Trick is this fancy schmancy FOUR LEAF CLOVER old fashioned paper trimming. You KNOW I swooooooned! Maj shared the eggs on the right with the Street Team for Pick Your Poison. She also collects amber....and now I have some! 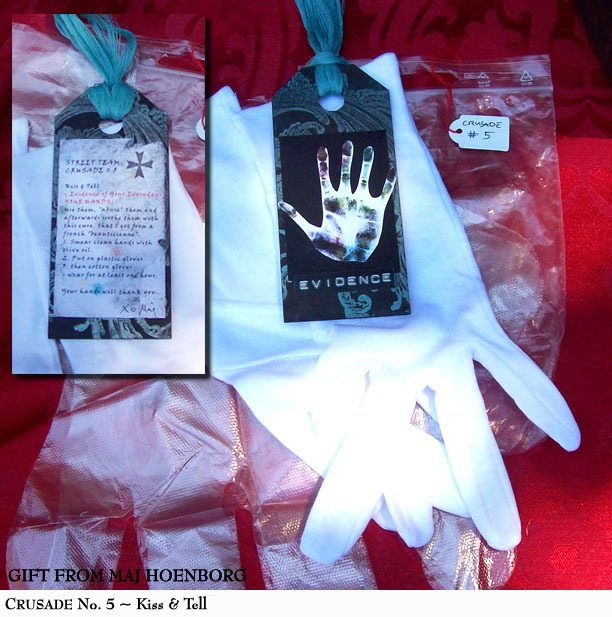 When I saw these white gloves I cracked up - thought they were Evidence gathering gloves like a forensic scientist would wear....afterall, the Kiss and Tell crusade was about "evidence" of your everyday stuff. But in reading her tag she says we use and abuse ours hands everyday, so she included a recipe for how to maintain nice soft hands. Cover in olive oil, put on plastic gloves, followed by white gloves. Wear for one hour. Thanks, I need that! She's a chicken. Press-on tattoos instead of real ink! Or maybe she has one and isn't telling us? How cute is she? Got this photo from her in May....so fun to have a face to go with the friendship. 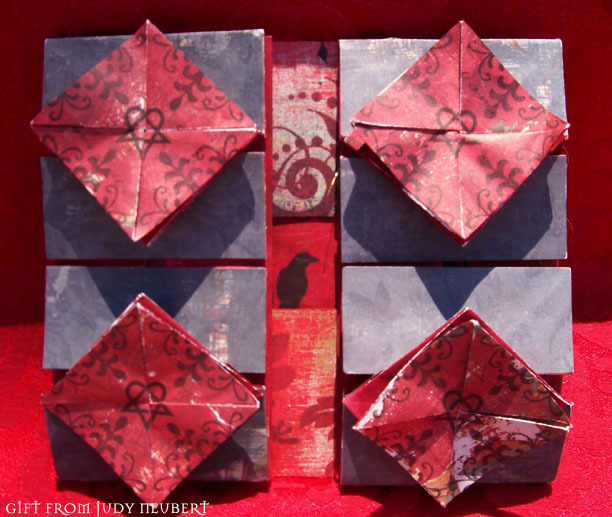 For her Playlist, Maj made this cool accordion book. 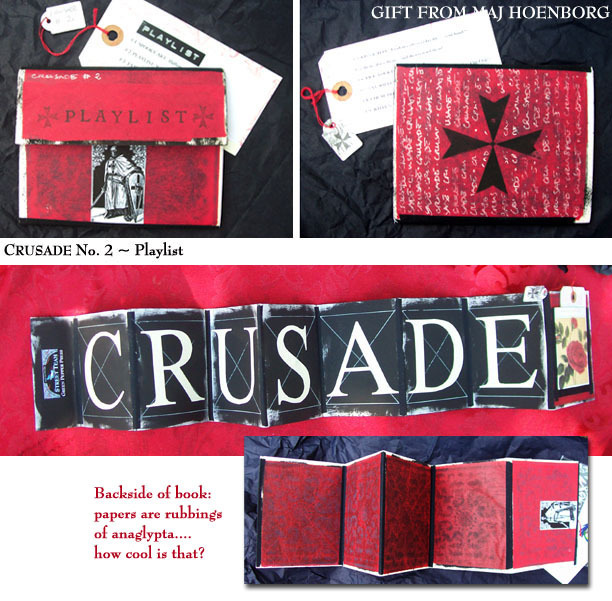 The pull-out tag is her listing of Crusades 1 through 9. Under No. 2 she writes, "Playlist: you're looking at it". The girl knows how to play doesn't she? Those letters above are each cut out and painted then applied in. It's a stunner. 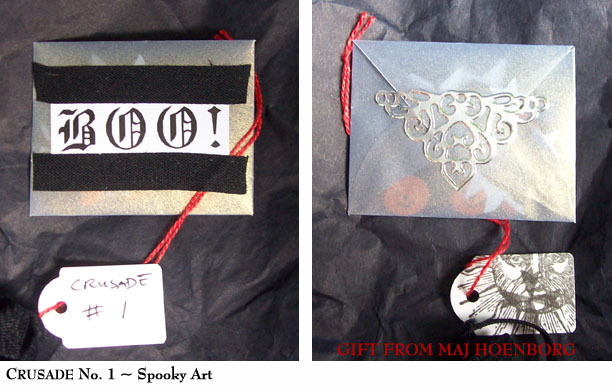 Here's a fun part of the story.....After opening everything and basking in the oh-my-gosh-ness of it all, I read the Playlist and it says under #1 Spooky Art: Halloween confetti. What? I didn't see any confetti. So like a day later I'm still curious and carefully peek through every saved wrapping.....and tucked into one was this mini envelope made of vellum and coated in metallicy coolness. I almost missed it because it felt like the thickness of folded tissue paper. Imagine how I cracked up when I read "BOO" on the front. This handprint is on the back of the card enclosed with the package. The excerpt reads: "It must be about a year since I responded to your 'grave dirt request'." Now there's something you don't see everyday. 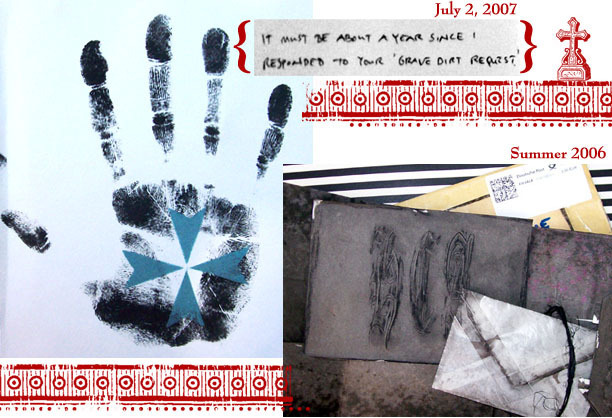 But yes, I made a call on my blog back in June 2006 for grave dirt of any famous poets or writers. 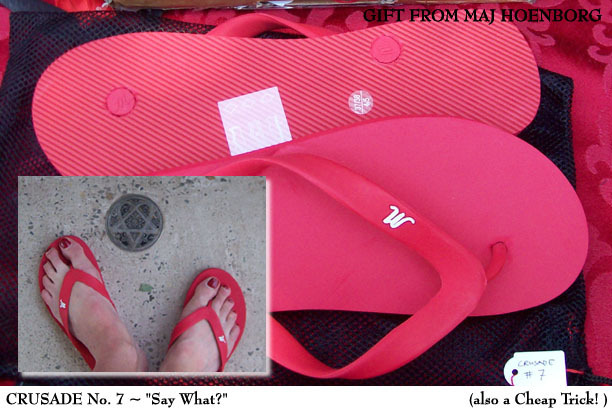 My introduction to Maj cam when she responded to me via email.....and inquired if I was serious. She didn't want to risk getting in trouble if it was a hoax. So a friendship was born, thanks to Hans Christian Andersen. He was buried in Denmark and when Maj went home for a visit last summer she collected some dirt from his grave for me and sent it here in a very cool paper cut envelope with the inititals HCA. She has become a very special friend and I am pleased to share her with you today. Winner for Crusade No. 9 ~ "What's that Smell" is Becky New. Congrats Becky! Everyone is invited to come Spread the Love with Crusade No. 10. I'm going to hop over there right now to tell them about Maj's package! On the trip back home to MN I was lucky to meet up with a new friend - Judy Neubert. We met at the Mall of America with the intention of having coffee. THAT was until I saw there was an Archiver's there...didn't take much coaxing to get Judy to spend our hour together shopping instead. Got myself hoards of paper, the fave being this new Basic Gray and Creative Imaginations. 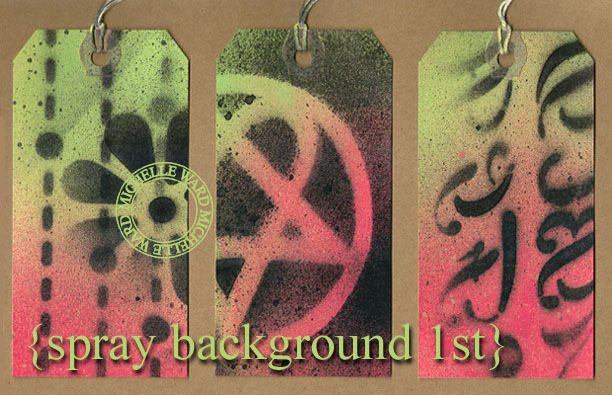 It began with the tag above. Got goosebumps? Then in the bag was this folded masterpiece. I can't begin to imagine how many hours and how much planning went into this.....my pictures hardly do it justice. 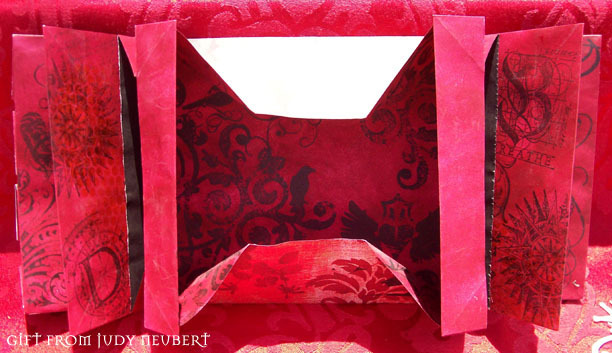 Every little detail was thought through.....many pockets to open, revealing many treasures found in the last photo. 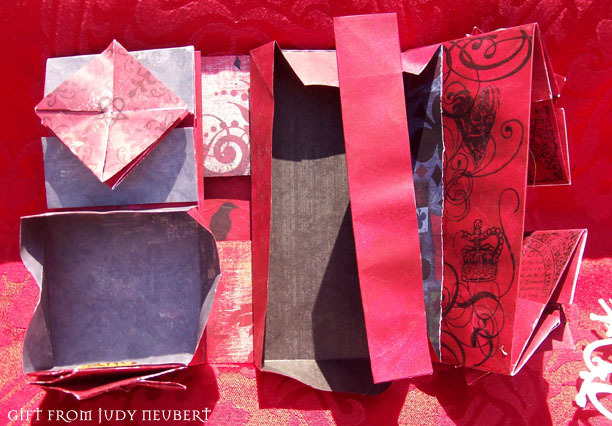 Here you can see a portion of the secret compartments opened. Look at the cool imagery everywhere too. Fully open....more great images, even some of my older designs. You KNOW I'm loving the colors too. Have you ever seen anything like this? I mean, it has three jillion openings. Told ya, work of heart. And here is all the loot from inside. Yep, she's been in the shackles....has become a HIM fan herself. Love THAT. She is such a clever one.....took the pins and threaded wire through them to create genius danglies. Judy - you're a gem. Was wonderful to meet you and I look forward to our workshop in October. THANK YOU for this special gift. You GET me. I only wish I could have opened it all in your presence so you could see how touched and enthused I was. 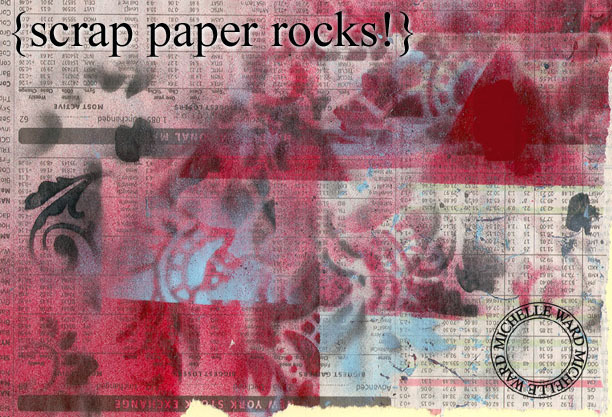 The SYNCHRONICITY: the paper I was scarfing up WHILE SHOPPING WITH HER is the SAME PAPER she used here. She never caved. 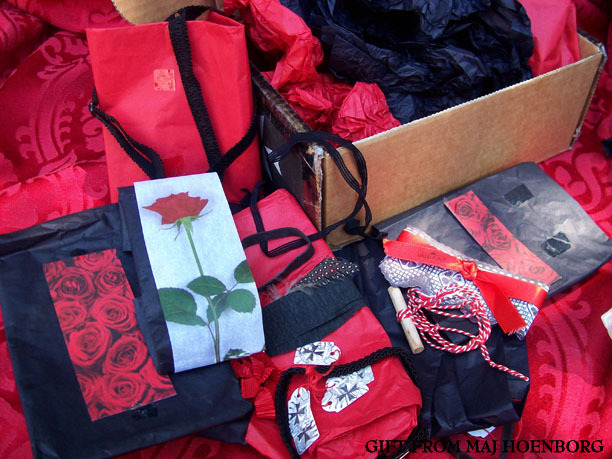 She never hinted that she had already seen the stuff, and had used THE VERY SAME PAPER in this gift. Shown below: back. Tomorrow: Part Two. Another case of SYNCHRONICITY. Are you watching? Go HERE. I wish it was being broadcast on tv like Band-Aid was.....Graham and Fallon almost went to the NY show. We can see more from home....looking forward to DD and Spinal Tap in London. 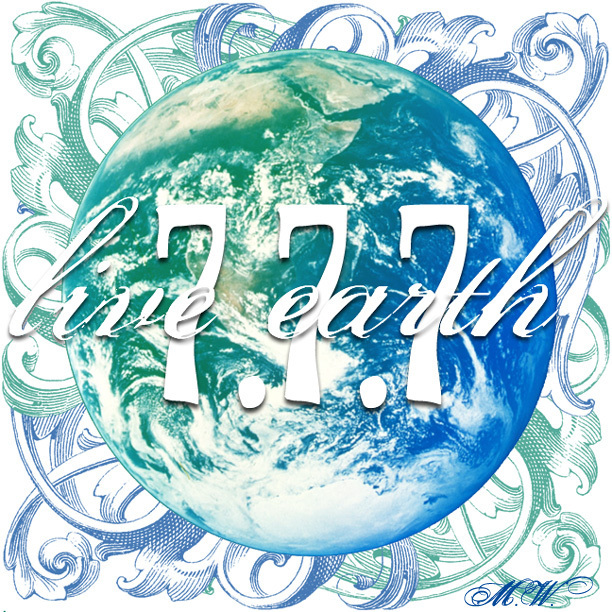 More importantly, it's really cool to see the outpouring of love for this earth. Do your thing, Recycle, Reduce, Reuse. If you get a xmas card from my Mom, this is what it will look like. 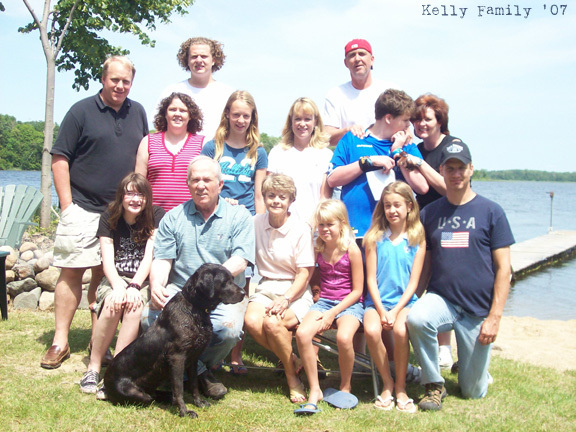 My sister and her husband, my brother and his wife, their three kids and dog, my parents, and the Wards. More evidence of the action-packed vacation. 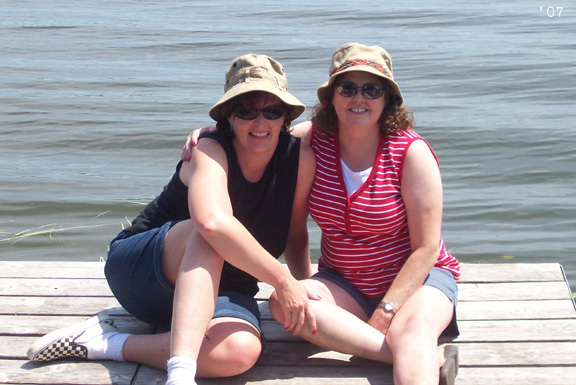 And below, Shannon and I for our every-time-we-are-at-the-lake-together-sisters-on-the-dock photo. I should get all of them together in one album shouldn't I?